Two studies in success: University of Rochester Medical Center and Trillium Health. Finger Lakes Community Health has partnered with two regional health systems to deliver telehealth services to patients in our community. The results speak for themselves. Video Conferencing can save thousands of dollars a year. 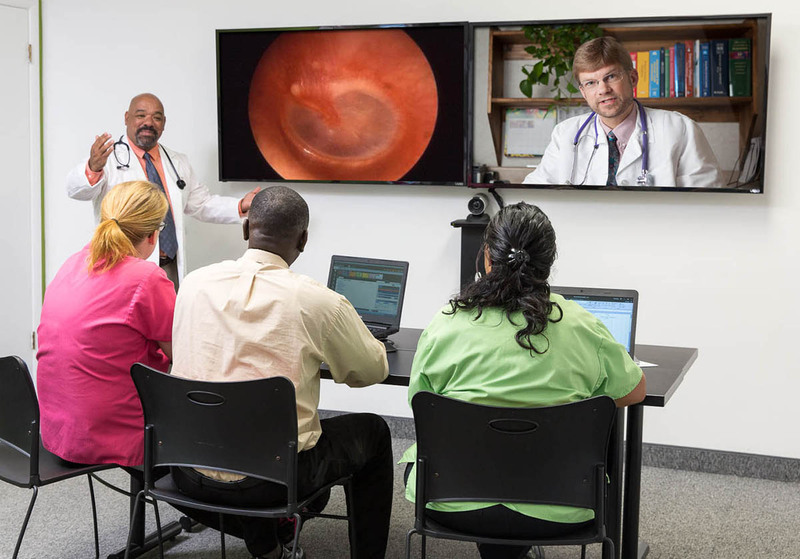 If you have multiple sites or routinely consult with providers outside your area, you can meet with colleagues and share information via video conferencing. This eliminates 1-2 hours of travel time for providers—time that can be put back into patient care. For one meeting alone, FLCH saved $52,000 in travel expenses over a one year period (including travel time and mileage). During the first six months of this year, FLCH saved approximately 1,050 hours in administrative travel time. Our monthly provider meetings are more cost- effective to conduct and more convenient for providers in the eight different communities that we serve. Sometimes language barriers prevent patients from seeing their providers on a regular basis. Telehealth systems provide access to patient interpreters. For bilingual patients or non-native English speakers, this can mean a world of difference. We also know how hard it is to recruit bi-lingual providers. Now you can use interpreters to help.